The Sefer ha-Bahir is a book of the Jewish Kabbalah, which is attributed to the Tannaite Nechonja ben ha-Qana, but sometimes Isaac of Akko and also Isaac the Blind are mentioned. It may contain elements of the older Sefer Raza Rabba. In 1174, the Sefer ha-Bahir was published as a manuscript by a french cabbalist school. The book became the most important text after the Sohar. The book consists of five sections divided into 200 short paragraphs. Par. 1-16 : Comments on the first verses of the Book of Beresheth (Book of Genesis; 1. moses) and general on the creation. Par. 17-44 : the Aleph-Beth (The Hebrew alphabet) with inspiration from the Sefer Jezirah, which connects the creation letters with the mysticism of the Torah. Par. 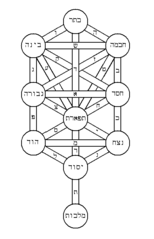 45-122 : The seven voices and the Sefirot. Par. 124-193 : The titles of the 10 Sefirot. Par. 193-200 : Conclusion of the argument and the mysteries of the soul.